What they promise: The H2O+ Sea Pure Facial Cleanser is 98% natural, vegan and biodegradable. It’s a sea-derived formula designed to give you healthier looking skin, as well as hydrate your skin, giving you a fresh look to your face! With it’s very light, citrus scent and smooth texture, it’s a perfect natural solution to makeup removal and cleansing. I would recommend this product because it’s gentle enough to be used on all skin types, and it doesn’t strip your skin’s natural oils. I have already noticed a difference in the way my skin looks and feels, so the result time has proven to be quick. 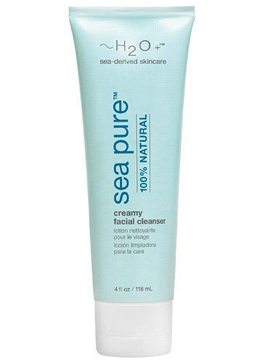 For anyone who wants a fresh feel to their face, H2O+ Sea Pure CreamyFacial Cleanser is an amazing and natural way to get there. The H2O+ Sea Pure Facial Cleanser definitely deserves an extra 10 points for being such an eco-friendly product: it’s almost 100% natural and completely biodegradable, a first for me with a skin cleanser.